This life-sized bronze statue represents, quite appropriately, an exhibition visitor. The quirky man in his long overcoat – hands held loosely behind his back, left foot half a step forward, head tilted back slightly and to the right – makes a distinguished but disarmingly carefree impression. 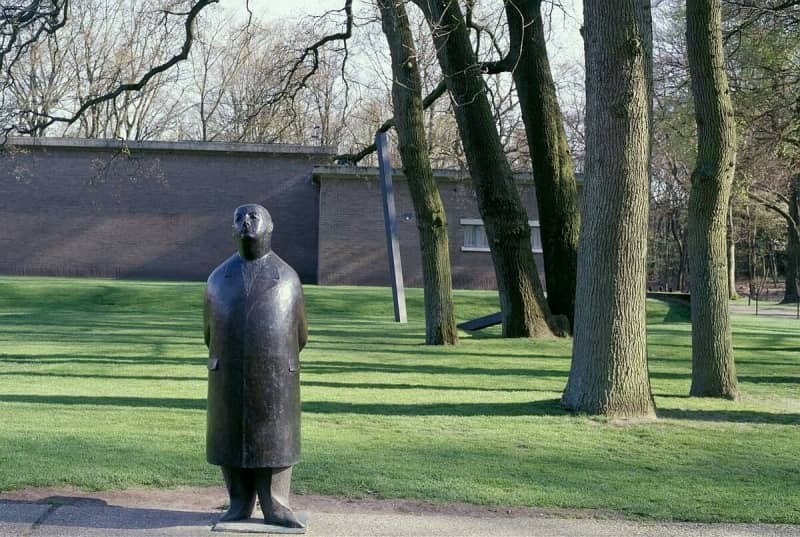 According to his maker, the Dutch sculptor Oswald Wenckebach, Mister Jacques symbolizes the Dutch citizen. Wenckebach strives for a sober, restrained design. For this, he takes his example from Greek classical sculpture. During a holiday in the South of France in 1953, he begins work on a series of eight sculptures with Mister Jacques in the leading role. This distinctive and unassuming sculpture is the last in the series. At the opening of the sculpture garden in 1961, the sculpture is given a prominent place on the lawn to the left of the museum. In more or less the same place, Mister Jacques still adorns the path to the entrance today. He is not only a visitors’ favourite, but also an icon of the museum.